It's been a fairly lean month for hobby time, but I have managed to start assembling a new Warriors of Chaos army. As I normally do with new armies, I have started on core units and hope to have around 1000 points to play with before I start any serious painting. It's just a grey horde at the moment, but I am thinking it will probably be a Khorne army, so plenty of red and brass in the warriors, with the marauders more generalised (unmarked). The new marauder horse boxset is a lovely piece of kit. The horses are possibly the best I have seen. There are seventeen marauder heads, many of which I have used on the older plastic marauder infantry to improve their appearance. The only (minor) fly in the ointment is that the rider's torso and legs are one complete piece, so there's no scope for twisting in the saddle dynamics. Still, I like the kit and will probably get another one at some time, if only for the extra heads. You can see some of them in the background of the pic, on the plastic marauders with flails. The chaos warriors are armed with great weapons. These are reasonably easy to convert from the weapons in the box, joining two hand weapons into one. I chose great weapons as I want the army to reflect the Khorne aspect of maximum carnage. This unit will be deployed six wide and with the mark of Khorne will have 19 S6 attacks if they get the charge. I think I need to practise my blood painting skills. I knew this would happen! As soon as the new chaos figures were released I caved in and ordered some of the new plastics along with the new book. They are supposedly a Christmas present to me, but I have had a couple of sneaky peeks at the book and the contents of the Marauder horsemen box. I know, what a naughty boy I am! 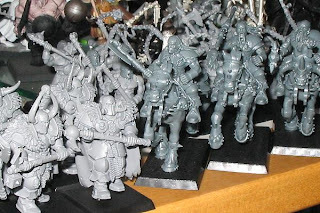 I already have 3 or 4 boxes of chaos warriors, one virtually painted up, plus 20 - 30 plastic marauders and around 15 of the older metal marauders, so I have plenty of raw material to build some core regiments. I was also thinking of adding daemons as special choices (my opponent is happy for me to do this strictly illegal act), but having leafed through the book I think ogres and trolls would be better choices, so I will await their release in plastic form. I will probably concentrate on non-specific models to start with, or I might just dedicate my core to Khorne, I can't quite decide. I suppose I should be able to do both by using a replaceable command group. I definitely want the Lord on Juggernaut model and have been dropping some pretty heavy hints for my Christmas list. I also have a few regiments I painted about 3 or 4 years ago, in a Tzeentch scheme. I could finish that off and have a 1000+ pointer ready to go with little effort. Perhaps I could get together a unit of marauders from the plastics, with a few plastic spawn mutations. Even though the new book allows mix and match gifts and marks, I will probably stick with the god-specific armies, for most games at least. My ultimate aim would be to have 1500 points dedicated to each of the pantheon, but that's a 5 year project. Although, I usually get distracted after a couple of months, so maybe it's a 10 year plan.